Description: Diskmag "HUGI", issue 34.
and reading Hugi for almost twelve years now! 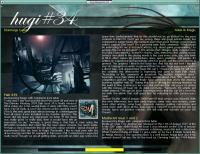 More specific credits inside Hugi#34. Freax volume 2 and much, much more inside! Press CTRL-1 to 6 to switch between layouts in general. Oxyron Party 2008 and everybody we might have forgotten. Hugi - Bringing the "Disk" back into Diskmag on Amiga!